Weddings and donuts might not seem like a natural pairing at first glance, but in fact it’s one of the most popular wedding trends of recent times. 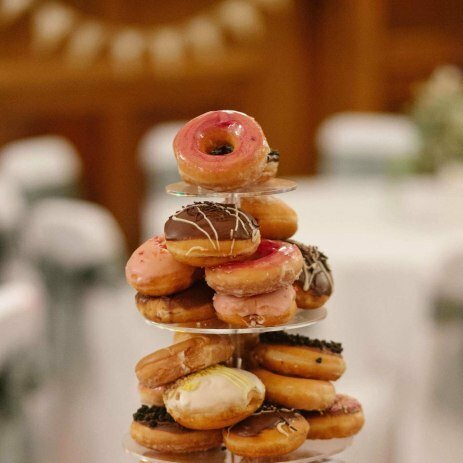 You can now find donuts at weddings in a variety of guises, from donut towers to donut cakes and the real showstopper - wedding donut walls! You can mix and match flavours, shapes and sizes and many wedding donut suppliers will let you experiment with a variety of toppings and glazes. For something more a bit more low key, but still donut related, why not serve up a batch of mini donuts as a late night snack for your guests? The perfect sugary treat to keep guests dancing all night long! To find out more about wedding donuts, the options available and to hear from the best local suppliers, simply complete a request form now. We have 2 gorgeous donut walls and offer a variety of packages to suit any event. Donuts can be a fun and modern addition to your wedding day, not to mention the fact that they are always delicious! Why not really make a fun statement and have a wedding donut wall installed? Unlike all of your other decorations, donut walls are edible, so you won’t need to worry about dismantling it after the wedding has finished - your guests will do that for you! These distinctive, treat-filled installations are also a real talking point and will get your guests chatting! Or why not offer personalised wedding donuts as a thank you gift, something guests can enjoy the morning after? To find out more and to hear from the best wedding donut suppliers in your area, simply complete a request form.